After years of skepticism about the claims of manufacturers promoting wide skis shaped like the defining parts of a rocking chair, I’ve come around. The rocker design rocks. What convinced me was a day on the Volkl Gotama, a portly plank 130 millimeters wide at the tip, 123 at the tail, and 107 underfoot. Recently, I took a pair all over Bald Mountain, the legendary hill, better known as Baldy, that has been attracting folks to Sun Valley, Idaho, since late 1939, shortly after Ernest Hemingway finished writing “For Whom the Bell Tolls” in room 206 at the Sun Valley Lodge. At first I was a trifle leery. This is a beefy board, and I was on the 178-centimeter version, 18 centimeters longer than the slalom skis I usually use. However, Brad Woods in the ski shop at River Run assured me that due to the rocker design, the length would not be a drawback because the points at which the ski touches the snow are much closer to the boot heel and toe than on a cambered ski with its slight upward arch. 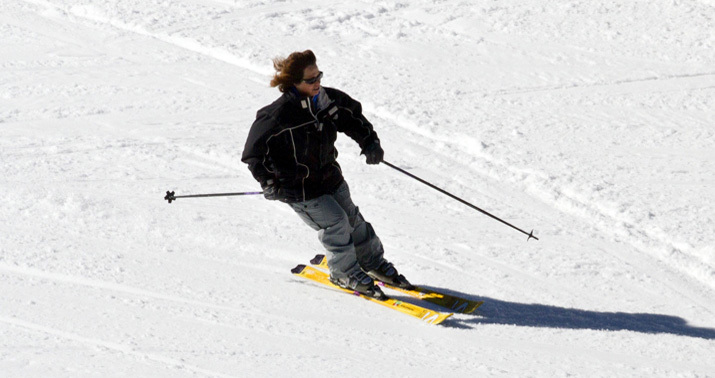 Consequently, rocker skis can be tipped on edge much more quickly and easily. Because I didn’t know what to expect from the Gotamas, I enrolled in College, the easiest run on Baldy, denoted by the green circle that usually marks terrain barely steep enough to induce motion. At Sun Valley, however, it’s not so easy skiing green. College tilts 19 degrees, which would easily rate the blue square of an intermediate run at many resorts. I angled down the slope from the top. The snow was firm and fast, not supposedly the most favorable condition for full-rocker skis, whose element is deep, untracked powder. I gained speed quickly, easy on Baldy, which has no flat spots. I weighted the downhill edge of the uphill ski, and instantly the Volkls snapped around in a quick, tight and surprisingly effortless C-shaped arc that reminded me of another German name: Porsche. I repeated the procedure, the result was the same, and my confidence soared. I let the skis go and started leaning into the turns as hard as I could. The Gotamas continued to perform with the same solid authority that makes this sport so addictive. Five inches of snow had fallen the day before, covering a surface that remained solidly frozen where the groomers hadn’t ventured. Can-Can, a blue run of about 25 degrees, was bumpy and icy under the fresh snow. The skis couldn’t have cared less. As long as I was positioned properly, they turned with the same sport-car precision. Next I tried Flying Squirrel, a blue run groomed nightly. Here I noticed another trait of the full-rocker design. Whenever I wanted to slow the skis, all I had to do was press with my downhill heel, directing force to the tails. Immediately, the brakes were applied. Later, I sampled untracked snow in one of Baldy’s eight bowls. 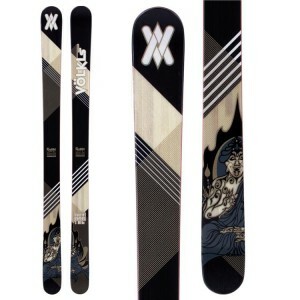 Although the skis were scraping a gelid surface under the powder, I got a sense of how they perform in bottomless snow. A skier with a good memory who last visited the resort in the early to mid-1990s would have good reason today to be a bit perplexed. Back then, the resort operated 13 chairlifts, including two, a triple and a double, that scaled its signature expert hill, Slide Peak, where snowmaking equipment was installed at about the same time. Slide, the incline of which ranges from 30 to 35 degrees on about 400 to 500 vertical feet, is the feature that makes Snow Valley entertaining for skiers and snowboarders who like steep, bumpy terrain. When it’s closed, as it has been for most of this season, Snow Valley appeals primarily to those of marginal to limited ability or who enjoy the obstacles of the freestyle park. Two decades ago, an equally precipitate run on the western flank of the area plunged beneath chair 5 to a parking lot that seems big enough to swallow Rhode Island. Chair 7 climbed a slope that has since been incorporated into the freestyle area. Chairs 4 and 10 were thriving. For the skier or snowboarder who has everything — except maybe a strong urge for self-preservation — an empty bag may be the ideal gift for that next big occasion. This bag comes in a $700 backpack, accessorized by a $129 cartridge for inflation. The Mammut Snowpulse Air Bag Technology system is designed to help a snow junkie survive an avalanche, a constant danger for powder-crazed daredevils who stalk deep untracked snow beyond the boundaries of designated ski areas. As long as they remain inbounds, where snow conditions are carefully monitored by the Ski Patrol, skiers run little risk of avalanche. However, in-bounds slides with fatal result are not unheard of. One killed a snowboarder late last month at Donner Ski Ranch near Lake Tahoe. At about the same time, two skiers at Squaw Valley, also near the lake, were caught in another slide. They survived. Beyond the ropes, the danger escalates sharply. Three years ago, people were killed in slides in unpatrolled back-country near the Mountain High ski area, close to Wrightwood. With a 30-liter capacity, the backpack would seem to carry just about anything a back-country skier could want or need in an emergency, short of a St. Bernard. There are pockets for ice axes and goggles. 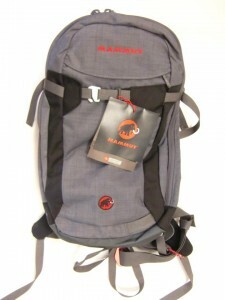 Space is designated for an avalanche beacon, GPS device, a probe pole, even a shovel, not to mention water, food and first-aid supplies, all noted in a check-list displayed on fabric inside the pack. Back in December, a red Christmas seemed like a distinct threat to the balance sheets of Southern California ski resorts. Only Bear Mountain remained in business, and it was limping at best. Uncooperative weather forced Snow Summit and Mountain High to halt their lifts after all three resorts had opened before mid-November, amid optimism prompted by the prospect of a profitable Thanksgiving holiday weekend clearly in sight. Toward the middle of December, cold weather returned, bringing several small snowstorms. 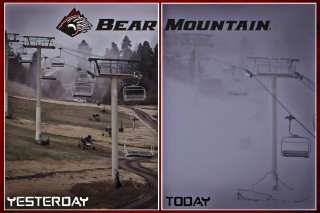 Far more important, however, it brought the kind of consistently frigid temperatures that play particularly to the strengths of Snow Summit and Bear Mountain, where huge snow-making systems draw unlimited quantities of water from Big Bear Lake. Although Sun Valley’s Bald Mountain offers nearly three times the vertical of our own Snow Summit, these two great ski areas ensure their success with the same winning formula. The fortunes of Sun Valley are linked as inextricably as those of the 60-year-old resort at Big Bear Lake to a prodigious capacity for turning water and compressed air into a four-letter word of supreme importance to that segment of the populace transported to ecstasy by its “plentitude” or driven to madness by its lack thereof. 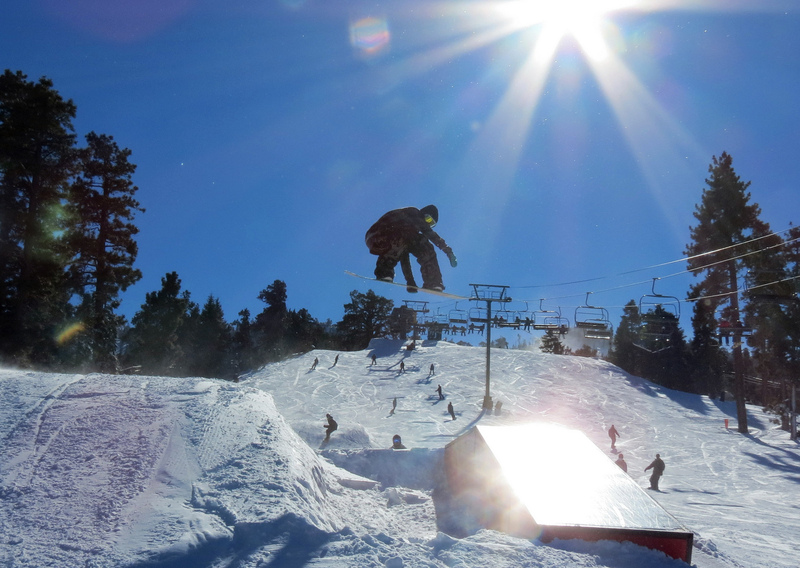 The 2012-13 ski and snowboard season has begun in Southern California. Barely. Snow Summit and Bear Mountain, which share ownership at Big Bear Lake, and Mountain High West near Wrightwood are selling lift tickets at sharp discounts, reflecting operations that are severely limited by mild temperatures after the cold snap two weeks ago that enabled them to make enough snow to open a couple of runs apiece. The result is not extensive, but diehard skiers and snowboarders have long displayed a readiness often bordering on masochism to drive heroic distances at the drop of a man-made snowflake in the local hills to relieve the long withdrawal between spring and late fall. They don’t demand a lot, just enough space on a surface of reasonable slickness to permit the fast turns that restore meaning to life. In a perfect world, rocks would be buried sufficiently to prevent damage to expensive equipment — but, hey, we’re sliding again, right? Don’t sweat the small stuff.